26.2 miles is simply unimaginable until you actually do it. In hindsight, I actually had to run a marathon in order to realize what it actually takes to train for one. While the CrossFit endurance training works (see my training schedule here), saves huge amounts of time, and I plan to use it again…you’ve got to have more long runs (13+ miles) to acclimate mentally (see #1). Dehydration matters – and once you get dehydrated, it’s too late, and there’s no catching back up – no matter how much fluids you knock back at water stations. Drink water early and often. I might be wearing a water pack next time. It’s probably worth its weight. Heat matters. Despite being in the middle of March – it was 80F by 9am. Not too bad if you’re standing still – but brutal if you’re moving. A marathon might be one of the best ways to see a city. You’re going at a slow pace. You’re traveling a lot of miles zig-zagging through neighborhoods. And looking around actually helps endure. 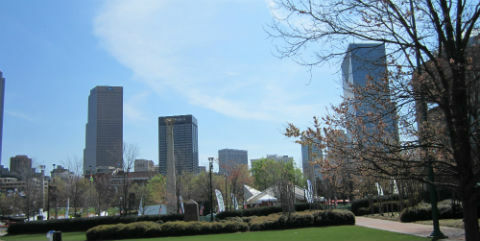 Atlanta is a much more beautiful city than I had imagined – with more nice neighborhoods than I thought. Registration fees for a well-organized event are totally worth it. The cops, coordination, shirts, bathrooms, food, water, etc are invaluable. Random strangers cheering makes a difference. Little kids cheering is even better. Spectators telling you how far to the finish *doesn’t help* (only 14 miles to go, wooo hooo!!!). But telling you how far to the next water station – that makes all the difference in the world. It’s near impossible to run your correct pace for the first 7 miles. The first 7 miles fly by in an excited adrenaline rush. Everyone hits a wall between mile 16 and 19. The mental trick is to think about running to the next water station – not to the finish line (see #10). Vibram Five Fingers are just fine for a marathon – provided you’ve been training in them. Really weird and random people run marathons. Volunteers who work the water stations are *amazing*. Atlanta’s Druid Hills…actually has **hills**. The marathon racers in the A group are true athletes. I never truly appreciated just how good they were until I barely finished one. Hip flexors give out before any other muscle. Atlanta’s Piedmont Park is a truly beautiful urban park. Glycogen packs are… like eating toothpaste. Better to go for protein bars or chia seeds. 26.2 is an absurdly long ways. There were 7 people over 70 who finished the race… 5 of them ran a faster race than me. The Atlanta course is notoriously hilly. And I’m sure there’s more – but 26 seems like a nice place to stop.